These little won ton wonders are great for big parties and better yet, it can ALL be made ahead of time, which is great when you want to spend your time visiting. This will make about a dozen of each flavor of won ton bites. Put them all together about 1/2 hour before you need them and bake all together on a baking sheet lined with foil or parchment at 350 for 10-12 minutes. Watch them closely as the won tons can burn quickly. Mix the apple, rosemary and white balsamic together and mix well. Stuff into 12 of the baskets and top each with brie and small sprinkle of pepper. Garnish each with a small curl of red peel. Caramelize sliced onions in a medium/low heat pan with butter and sprinkle of salt. To get a really nice rich caramelized flavor this should take about 45 min stirring regularly. When the onions are done, remove from pan and turn up heat. Season meat with salt and pepper and then very quickly saute steak strips- only about 20 seconds total. You want them a little on the rare side so that when they are baked they don’t get over cooked. Roll blue cheese into finger nail size balls- enough for one per won ton- and dip one side in the horseradish. 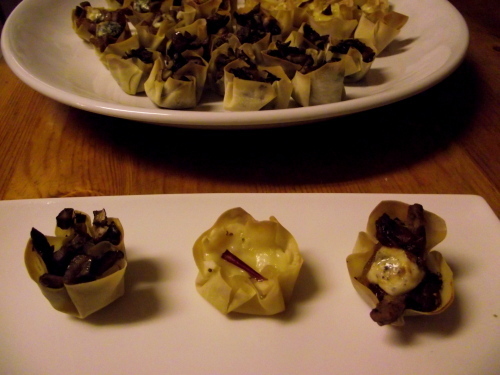 Lay one strip of beef in the won ton, add a clump of onion and top with blue cheese. Garnish with thin strips of chives. Finely chop all the mushroom and then saute on med/low heat with butter and salt & pepper. Cook mushrooms for about 6-7 minutes (or until they start to lose their juice) add minced garlic and stir well for a couple of minutes. Add wine and cook for another 10 minutes or until almost all liquid in pan had disappeared. Stuff into won ton baskets and garnish with thin strips of chives. I cut the corners off with scissors so they fit into the muffin tin a little better. Brush all excess flour off the wrappers and tuck them individually into muffin tins. Make sure your smoothing the bottom out a little so that they won’t tip over when full. Bake at 350 for about 10- 12 minutes but keep an eye on them- they brown quickly. **These can be made the day before but do not stuff them any earlier than 30-40 minutes before you’re ready to bake them. Filling them too early will make the won ton baskets mushy and soggy.